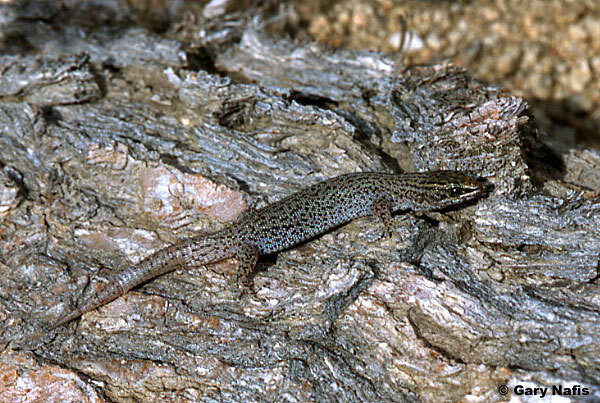 The Night Lizards, genus Xantusia, have small granular scales on soft skin. Xantusia henshawi is shown here. 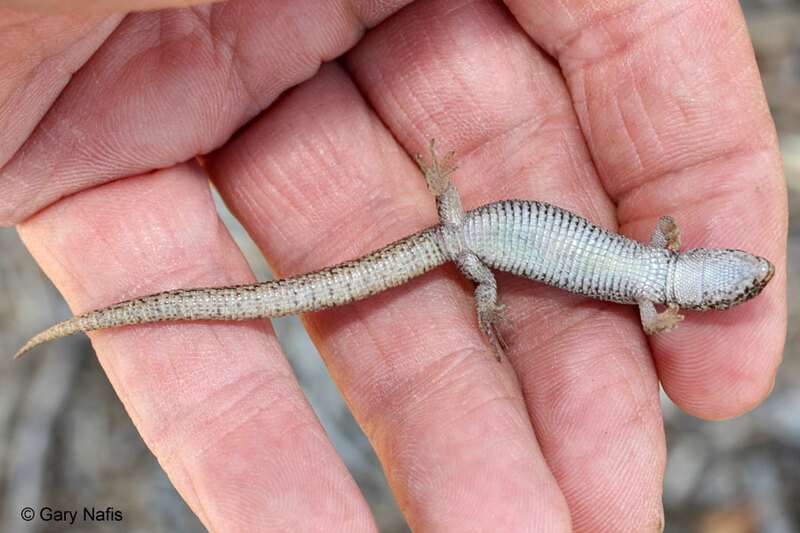 Many species of lizards release their tail when they want to escape from a potential predator. The tail then continues to wriggle like a living creature. 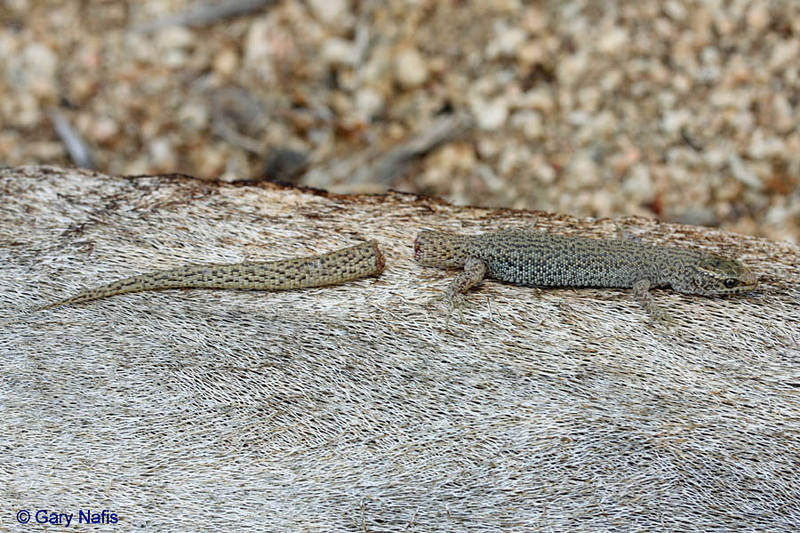 The aim is to momentarily distract the predator away from the lizard's vulnerable body, allowing it to escape, while the predator is left holding or trying to catch the expendable tail. This tail dropping is called "Autotomy." 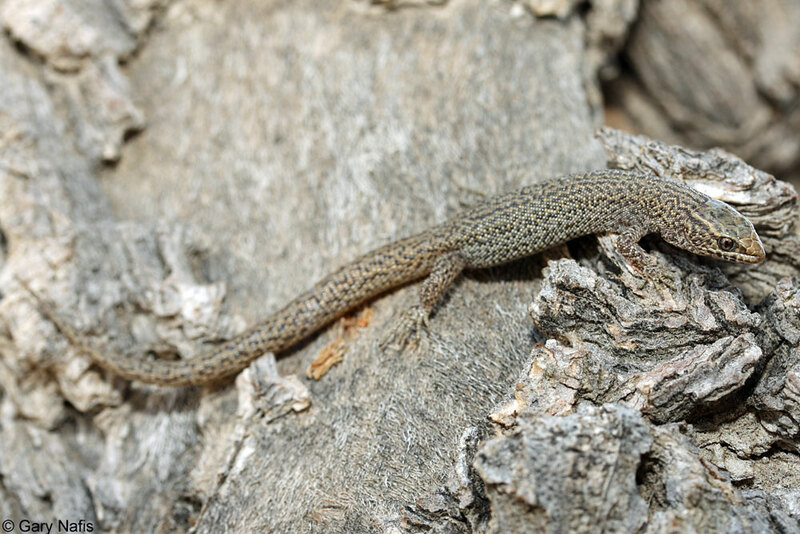 Losing the tail does not seriously harm the lizard, and may save its life, but the loss of a tail might have a negative effect on the lizard's social standing. Dropped tails do grow back, but these regenerated tails are often not as long or as perfect as the original. 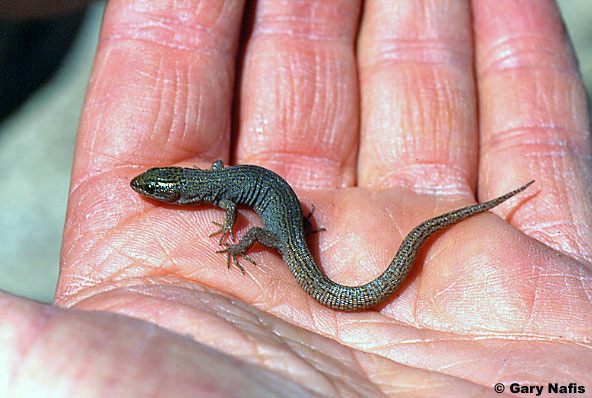 A small thin lizard with soft skin with fine granular scales on most of the body, a head covered with large plates, lidless eyes with vertical pupils, a gular fold, and a detachable tail. Dorsal scales in 30 - 50 lengthwise rows at mid-body. Color is olive, grayish, or brown with light brown or black spots, sometimes forming narrow stripes. A narrow beige stripe, edged in black, extends from the eye to the shoulder. The underside is whitish and made up of large square scales, usually in 12 rows. Males have enlarged femoral pores. Diurnal (contrary to the common name) and crepuscular. May be nocturnal during the heat of the summer. 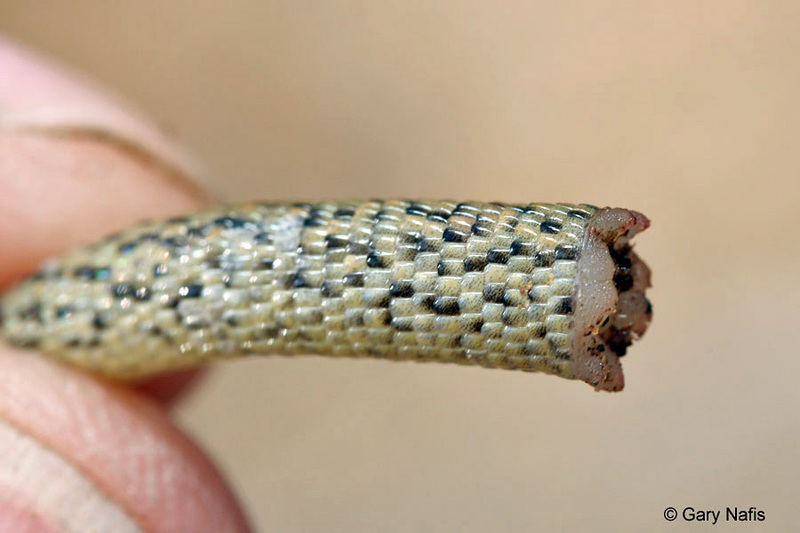 Abundant, but secretive - spending most of its life undercover in and underneath fallen vegetation and debris, such as Joshua tree branches, dead yucca clumps, logs, pine bark, and also under rocks and in rock crevices. Not typically active on the surface away from cover. Sedentary, spending most of its life in a small area. In 2010, researchers at UC Santa Cruz discovered that Xantusia vigilis live in family groups, showing social behavior more typical of mammals and birds such as primates, ground squirrels, and woodpeckers. 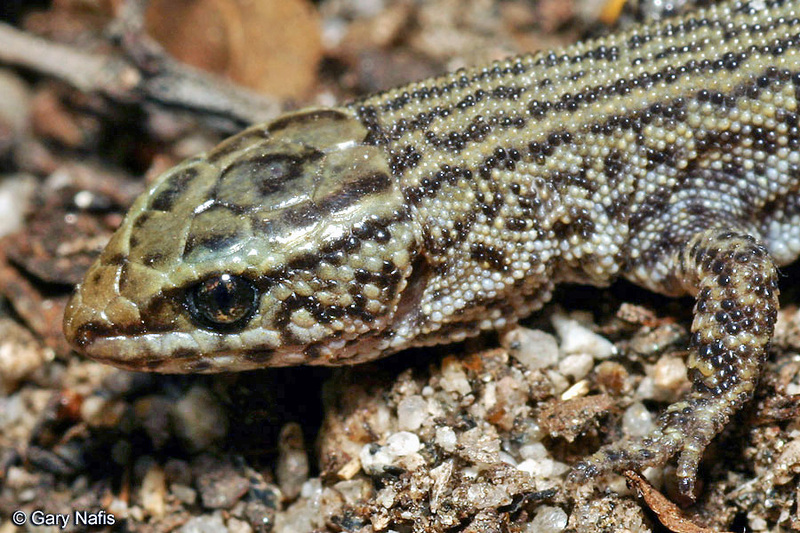 (A few other lizard species have also evolved a social system around a nuclear family.) 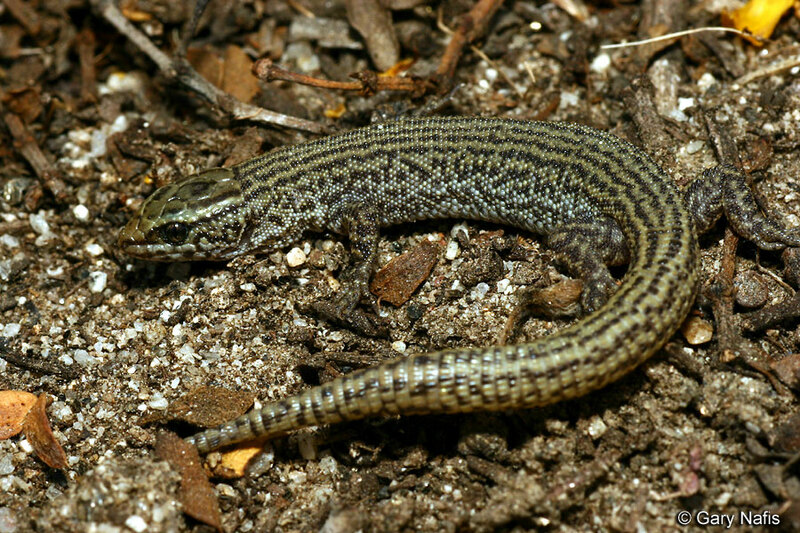 The young night lizards remain with the father, mother, and siblings for several years, all living under the same plant debris.The young feed themselves and do not receive any direct care from the parents. It is not yet known what survival advantages the group living arrangement provides. When frightened, runs away quickly and dashes under cover. The tail breaks off easily and continues wriggling to distract would-be predators as the lizard runs away as you can see in this video. 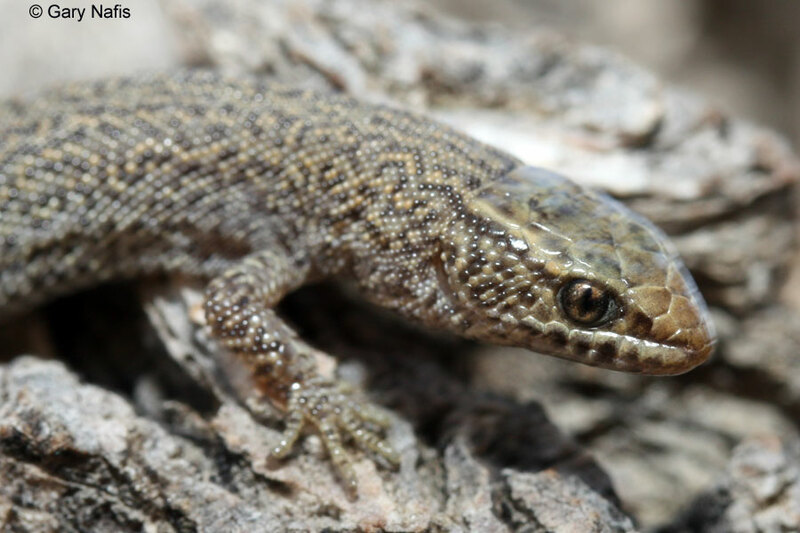 This does not hurt the lizard, although it might suffer from the stress of attempted predation, the loss of fatty energy that is stored in the tail, and have difficulties finding a mate during breeding season due to a less healthy appearance. Eats small invertebrates inhabiting the decaying vegetation in which it lives including ants, termites, beetles, caterpillars, crickets, and spiders. Bears live young, 1-3 per brood, from August to October. 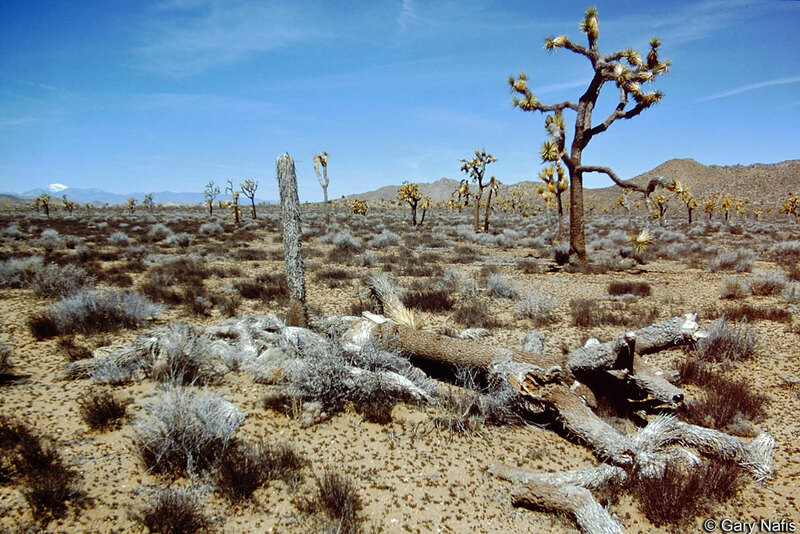 Utilizes a variety of habitats in arid and semi-arid areas, including those grown with Joshua tree, desert scrub, pinon-juniper, basin sagebrush, chaparral, pine-oak woodland, and yucca. 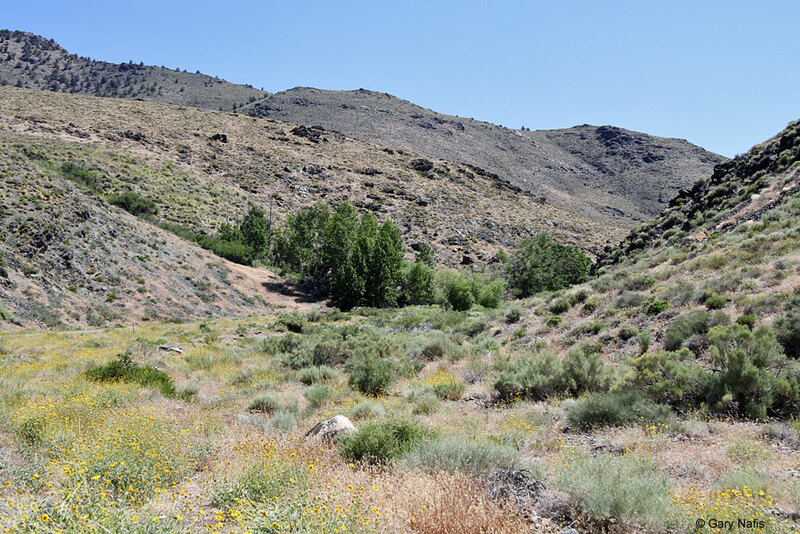 Found on the desert slopes of the Peninsular ranges, throughout the Mojave Desert, along the east slopes of the Sierra Nevada Mountains north to west of Bishop, the Inyo and Panamint mountains, the Greenhorn and Piute Mountains and upper Kern River Canyon in the southern Sierra Nevada Mountains, the coastal side of the mountains in upper Santa Clara River drainage, the headwaters of Big Tujunga and the upper San Gabriel River drainage, and the inner coast ranges at the Panoche Hills and Pinnacles National Monument. Also found on Santa Catalina Island, but these may have been introduced. 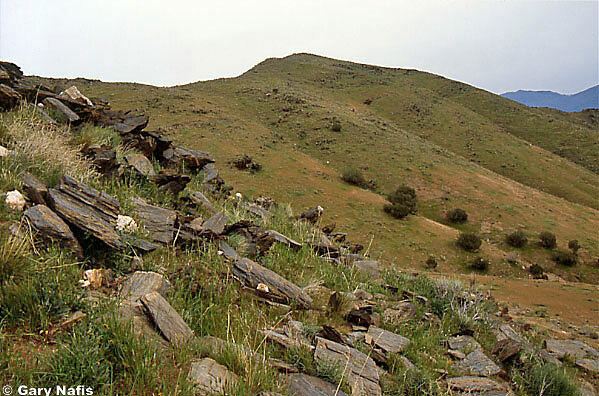 First locality records for Mono County were published in 2016 (Herpetological Review 47(3), 2016) extending the range to the northernmost localities for the species west of Utah. The range extends east of California into Nevada, Arizona, and extreme southwest Utah and south barely into Mexico. Several subspecies of Xantusia vigilis are traditionally recognized, including two in California - X. v. vigilis, and X. v. sierrae. Using nuclear DNA studies, Leavitt et al, 2007, provide support for the recognition of new species within the X. vigilis complex, including X. wigginsi in California, but they continue to recognize the subspecies X. v. vigilis and X. v.sierrae. In addition, they identify several major clades, four of which occur in California - X. vigilis, X. wigginsi (now a full species), a Yucca Valley clade, and a San Jacinto clade. 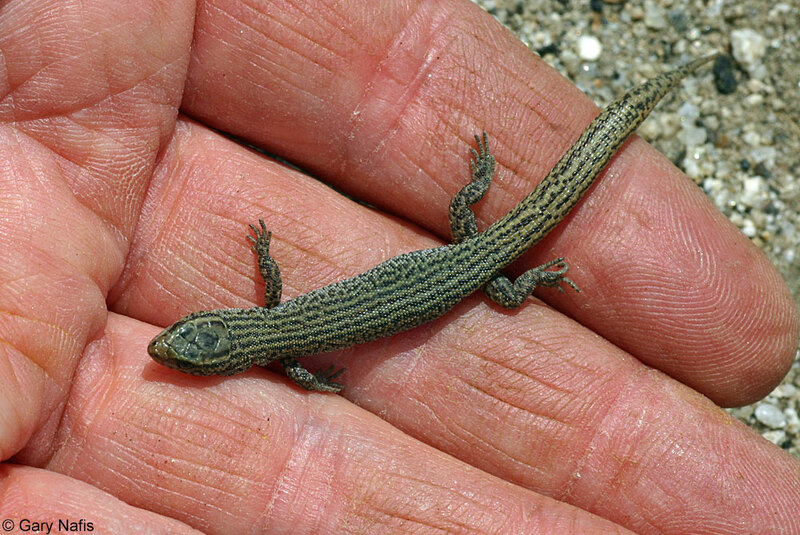 The 2008 Society for the Study of Amphibians and Reptiles Standard Names List uses X. vigilis based on Sinclair et. al (2004, Am. Nat. 164:396-141). Molecular Ecology 16 (21), 4455–4481.